When you need to hire plants & trees Real Oasis strive to bring to the events industry the best solutions available. Working with Real Oasis you can hire a wide variety of plants & trees and related greenery for indoor & outdoor events, films and photo shoots. 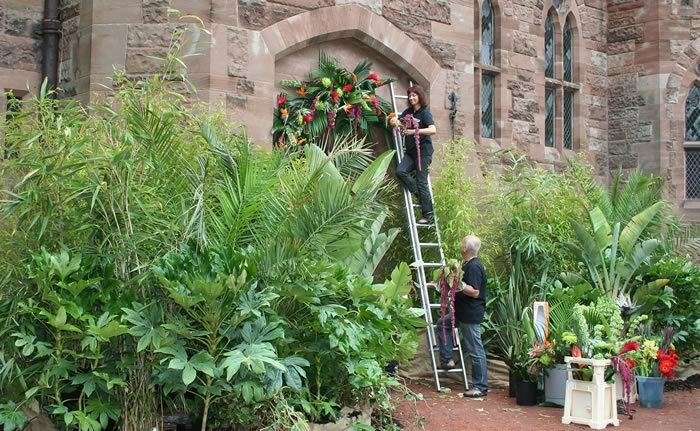 So if you need to hire stunning specimen trees, plants and props to help create your special event – why not create a real oasis! A selection of some of the latest plants & trees and related props available for hire. Our hire range of bespoke wedding hearts or beautiful Birch trees, stunning Ivy wedding arches. An exciting new range large leaf evergreen plants Phormiums, Fatsias, Cordylines palm trees… and a new range of large statement centre-piece trees and plants through to all weather settees and chairs & high powered LED lighting for added night time impact. Combined with delivery available 7 days a week throughout the UK, in-house knowledge, limitless ideas and expertise and projects featured on TV, magazines, private weddings, prestigious exhibitions… we would like to think we make hiring plants, trees & props…to help create special events a pleasure! Never worked with us before? Real Oasis have a huge client base – check it out you’ll be in good company we promise. So if you want to discuss your hire requirements please call 07929 121347 or 01606 860086.